In 2004, The Incredibles busted onto the big screen in a triumphant, Oscar-winning thrill ride for Disney/Pixar. They had the potential to be Disney’s shining superhero franchise before the Marvel Cinematic Universe was ever created and out of all the Pixar films to warrant a sequel, this was the one that was set up and expected to eventually come. So, why did it take fourteen years for their return? Writer/Director Brad Bird had a lot on his plate between 2004 and now, however. Three years after The Incredibles, he wrote and directed another Oscar-winning animated film in Disney/Pixar’s Ratatouille. Following, he directed Mission: Impossible – Ghost Protocol in 2011, and even turned down directing Star Wars: The Force Awakens to write and direct his more ambitious feature of Disney’s Tomorrowland. He’s been a busy man in the last fourteen years and unfortunately, The Incredibles had to take a break from fighting crime in the meantime. Included before the film is a short but sweet message from Brad Bird himself as well as the stars of the film, Craig T. Nelson, Holly Hunter, and Samuel L. Jackson apologizing to the fans for the longer than anticipated wait but to trust that it’s been worth it. The Incredibles 2 begins immediately where its predecessor left off. The Underminer has attacked the city and it’s up to our new superhero family to stop him. The action picks up immediately and you’ll find that here and throughout the entire movie that the action pieces are absolutely breathtaking. Bird doesn’t miss a beat in providing awe-inducing, eye-popping action that’s incredibly entertaining to watch. The story this time around is a little derivative of the first film. Instead of Mr. Incredible/Bob (Craig T. Nelson) in the spotlight, it’s Elastigirl/Helen (Holly Hunter) doing the heavy lifting as she’s recruited by the pro-superhero businessman Winston Deavor (Bob Odenkirk) to try and influence the public opinion of superheroes back to positive after the devastation caused while trying to save the city. It’s very relevant to the world today as Bird addresses issues such as politicians and media controlling public perception of certain issues and more importantly that every issue doesn’t require the assistance of a big strong man to see the job done. He even pokes fun at more trivial issues like common-core math and how ridiculous it is to “change math.” Math is math! As mentioned above, Helen is the one out fighting crime nightly, so it’s Bob who’s at home with the kids and this provides an ample amount of comedy throughout the entirety of the film. Bob is used to being the superhero, but he needs to be a different kind of hero in this film and the adjusting period is quite comical. Violet (Sarah Vowell) is angsty and dealing with boy drama. 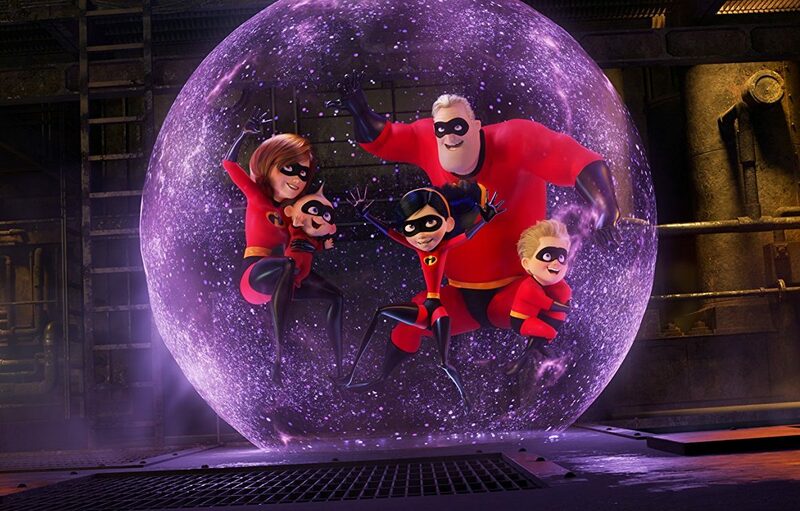 Dash (Huck Milner) needs help with his homework among other things, and baby Jack-Jack (Eli Fucile) is demonstrating multiple superpowers that Bob just can’t keep up with including disappearing entirely! While Bob is running on fumes at home trying to keep up with the kids, Helen is working tirelessly with Winston and his sister Evelyn (Catherine Keener) to solve the mystery of the new supervillain, the Screen Slaver, who’s shtick is to hypnotize their victims and coerce them into doing their evil-doings. The action is still very present throughout the film but it does take a backseat for a bit as the film becomes more of a spy film, but at no point is it ever not fun. Familiar characters return, including Brad Bird himself reprising his role as the sassy Edna Mode and Samuel L. Jackson as the ice-slinging Frozone. Several new heroes are introduced as Elastigirl inspires them to come out of hiding, most notably Sophia Bush as a portal-creating teenager named Voyd. The only real complaint I had regarding the film was its predictability in some regards. I won’t spoil anything here, but even when the film tries to trick you into thinking one way, the overall outcome still remained mostly predictable. Regardless, it was still fun the entire time. It’s been fourteen years, but Brad Bird knocked it out of the park once again with The Incredibles 2. Hopefully we won’t have to wait as long if there’s going to be an additional entry to the franchise. It’s still very much wide open.